First, let’s talk about the difference between plantains and bananas. Plantains are part of the banana family but aren’t eaten raw. The plantain averages about 65% moisture content and the banana averages about 83% moisture content which affects the flavor as well. Plantains are typically longer and have a thicker skin than bananas. Plantains vary from the green, starchy fruit to the ripe, sweeter version and are used very differently in recipes. The plantain recipe highlighted in this post is using the ripe fruit in a sweet side dish called ‘Plátanos Maduros en Gloria’. 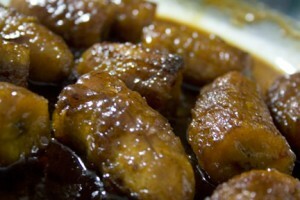 It is a typical sweet side dish as part of the Costa Rican casados (typical food). This is a typical cheap food found in Costa Rica. Total amount spent on the dish: $2. Serves 6. 1. In a large pan, melt the butter and saute the plantains on medium heat until golden. Add 1 cup of sugar, cinnamon, nutmeg, clove, lime juice and vanilla. Stir for 1 min. 2. Add water and sprinkle on the remaining sugar. 3. Reduce heat to low and cook until the liquid is reduced and caramelized. Serve hot, or let cool.